Do you get a CSA box? Or shop at a farmer’s market? If you do, then you probably get carrots with the greens still attached. AND THEN you probably throw them away. In my experience, most local markets take them off before they’re even placed on the sales floor. Even in a place like Whole Foods or Sprouts, cashiers may ask you if you want to detach the tops as they bag your healthy loot. Before today, your answer would likely have been, “Yes, thank you!” But now that you’ve looked at this recipe, you will decline their polite offer saying instead, “No thank you. I’m going to use them to make pesto!” They will be in awe of your creativity and will probably want to be your friend… or lover. I’m not making any promises though. Carrot tops are oft neglected, but they really just taste like a cleaner, fresher, greener carrot! Don’t be scared… just try it! If you don’t want to use chicken thighs, you could sub for chicken breast or even ground chicken or turkey. This pesto is also great with a quinoa or lentil dish (for all you vegetarian, plant-based peeps). Add chicken thighs, onion, and garlic. Sauté and stir until the sides of the chicken are browned and the onion is fragrant. Add shredded carrot and pesto. Lower heat. Stir until chicken is cooked thoroughly and the pesto begins to reduce and caramelize a bit. 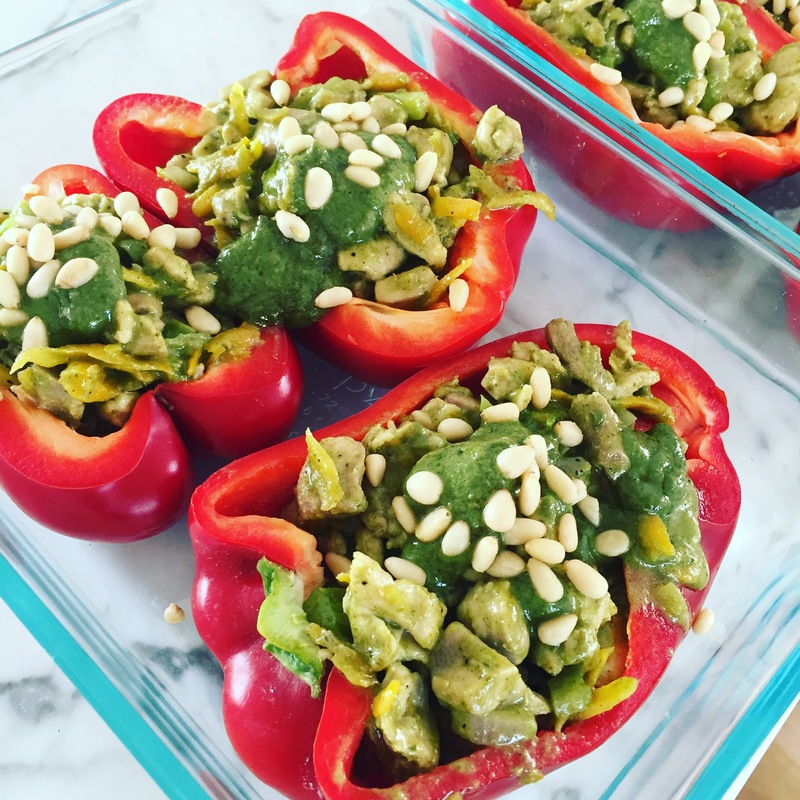 Divide chicken mixture into bell pepper halves and serve with a dollop of fresh pesto and a sprinkle of pine nuts.